>I’m a little late on the View Askewniverse and the Kevin Smith franchise. I like the Smith has created a continuous home for his recycled characters. There’s something completely comfortable about continuity and furthering along a fabricated character’s story. There’s also something cheesy about it too, but I definitely don’t get the cheese vibe from Chasing Amy. 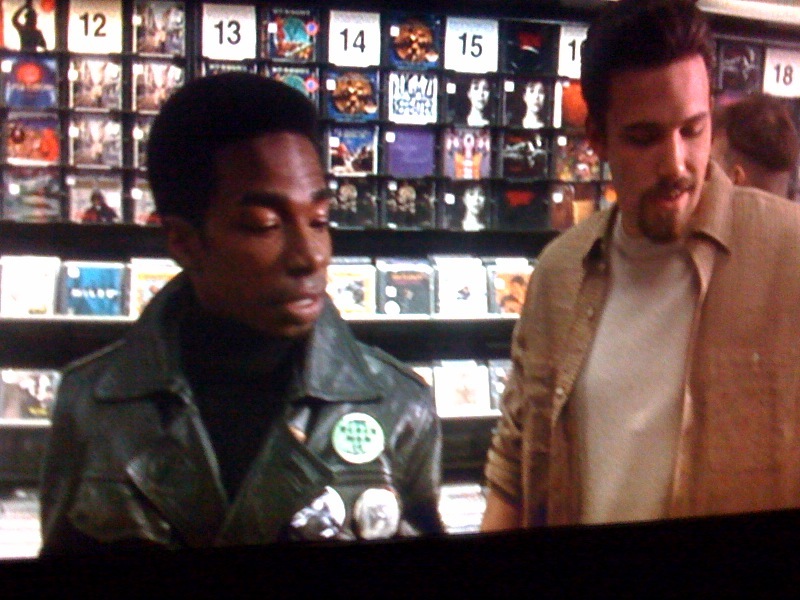 I couldn’t help but think about how much the record store Ben Affleck’s character was browsing in looks like BMV Bloor’s record store downstairs. Same set up I guess. For a New York film, there weren’t many shots of the city. Thank goodness for Hollywood! I stumbled upon this article today, an interesting expansion on Sunrise Records’ part. I was employed by Sunrise Records for a solid five years. It was my first job that I felt excited to say I worked at. Through that job, I met a ton of interesting people and learned much more than I would have just folding clothes. But after a long overdue leave, I told myself I wouldn’t buy a single thing from this record chain again. Although their breadth only extends throughout Ontario, they are a large chain store. This store prides themselves on being called independent, I suppose in some respect they are but in mind mine, they certainly are not. I was most appalled by their horrible treatment and lousy pay to their staff. For the first time after reading this article, I’d say they’re taking a step into the right direction. Although, I wouldn’t trust the cleanness of any of the Sunrise stores. They are, without a doubt the dirtiest record stores I’ve ever been to. So, Sunrise, you have moved into the right idea – specialisation has always worked for you. But really, I don’t think I’d buy a record in their if I had the choice. I always try to buy local when I can, but your record store just doesn’t do it for me. I’ve always said Sunrise has been able to compete with HMV because they have a Ticketmaster in shop. Have you ever thought of just how many people walk into an HMV asking where the Ticketmaster outlet is? Amazing. One more thing, Tom Plewman sounds like a pretentious guy. I keep harping on the fact that working in a record store doesn’t mean you know everything. The thing I really love about music is that it is so eclectic, different things attract different people. The young salespeople simply have different taste than you do. I will be the first to admit I pass extreme judgement on anyone who likes the Canadian band whose lead singer’s first name is Chad, but beyond that, everyone is free to like as they do. Plewman’s comment just comes off as close minded. Tom Plewman with his labour of love, the new classics and jazz floor at Sunrise Records. Just north of Yonge-Dundas Square — an area that was one a record store mecca — there’s a guy trying to sell old-school classical and jazz CDs, the kind that come in a clear-plastic case wrapped in impossible-to-open plastic. Is this an act of rabid nostalgia, or is there something he knows that the rest of us don’t? The new department at Sunrise Records — an Ontario chain best known for pop, rock and DVD sales — has been masterminded by Tom Plewman, a vigorous, smooth-talking, music-loving, 60-something veteran of radio and music retailing. Where others have faced retail ruin, Plewman sees opportunity. A renovated second floor at Sunrise shows off a substantial cross-section of new releases and catalogue titles in classical, jazz and blues, all hand-picked by Plewman and Frederick Harrison, a veteran of the now-demolished Sam’s store across the street. Plewman says Sunrise owner Malcolm Perlman is keen to wring some revenue from the unused second floor of the Yonge-and-Dundas store. Hopefully, Perlman is a patient man when it comes to a return on his investment. In the first weekend the new department was open, back in October, Plewman says he rang up three sales — all to out-of-town visitors. Over the course of a 45-minute visit just before lunch one day earlier this week, one customer came in — not to browse, but to ask a specific question. “Getting this place off the ground has been frustratingly slow,” Plewman admits. Circumstances haven’t exactly helped. Demolition work and the former Empress Hotel burning down across the street haven’t been good for pedestrian traffic on this stretch of Toronto’s Main St.
There’s no money for advertising, so Plewman has to wait for word-of-mouth referrals. He is certain these will come, because he can offer people product that they can’t easily find somewhere else. Plewman walks me over to a CD of the original 1965 album by the Paul Butterfield Blues Band. “This is mind-blowing stuff, and you’re not going to find this at any other store in Toronto,” he asserts. Like a proud father, the retailer points to a set of Mozart piano concertos played by late piano legend Alicia de Larrocha. “These are sublime. They’re the best recordings ever,” he gushes. Welcome to an old-fashioned, customer-focused shopping experience that Plewman describes as “the thrill of discovery” — of coming in to browse and being open to surprise finds. It’s an experience Harmik Grigorian relies on at L’Atelier Grigorian, Toronto’s last remaining independent classical and jazz record store. Grigorian has carefully tended his Oakville and Yorkville stores and built a website filled with advice for would-be customers. Like Plewman, Grigorian prides himself on being able to source difficult-to-find CDs and DVDs. Grigorian and Plewman tout their personal love of music and knowledge of the market. It allows them to make recommendations to store visitors — and also allows them to identify the real gems in each label’s catalogue. “The young salespeople at the labels no longer know anything about the music,” Grigorian explains, so he has to take each month’s catalogue and make his own choices. For him, as well as people who walk through the door of his store, the enduring thrill is “in feeling the wealth of music,” he beams. For him, that wealth still needs to come in a clear-plastic case wrapped in impossible-to-open plastic.